Check out this 1920s Speakeasy themed party from Sweetwood Creative Co. and tips for how you can host your own Murder Mystery Dinner. Fall is our favorite time to gather with those we love. Our top three tips for stying your Thanksgiving or Friendsgiving table this year. Three tips from the pros at Sweetwood Creative Co. for hosting a holiday dinner in your home that won't drive you mad or break the bank! 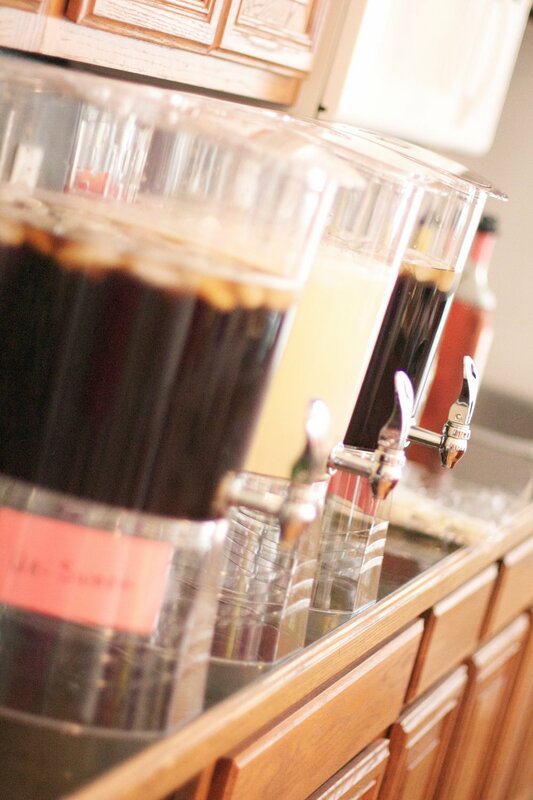 Details of a Kate Spade inspired surprise birthday party. Today I'm excited to bring you a tutorial for my favorite custom centerpiece I've built to date! 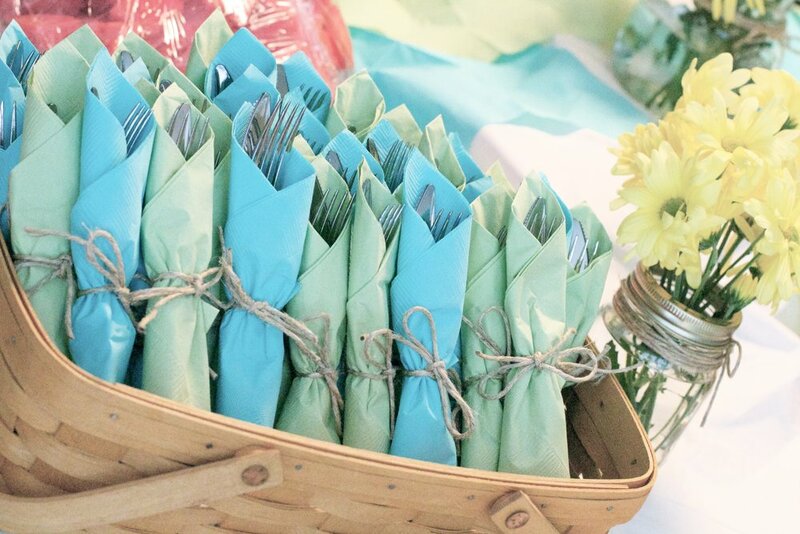 We made these beauties to complement some picnic tables we had rented for our event - it was a great way to bring the outdoors inside and create a cozy, rustic and casual environment. 10 ct. Battery Operated Edison String Lights - I got mine at World Market (no longer available) but you can find similar HERE at Target. 4ft Birch Sticks 3-Pk from Hobby Lobby (they don't have them online) $15.99/set of 3, but use your HL app for 40% off! 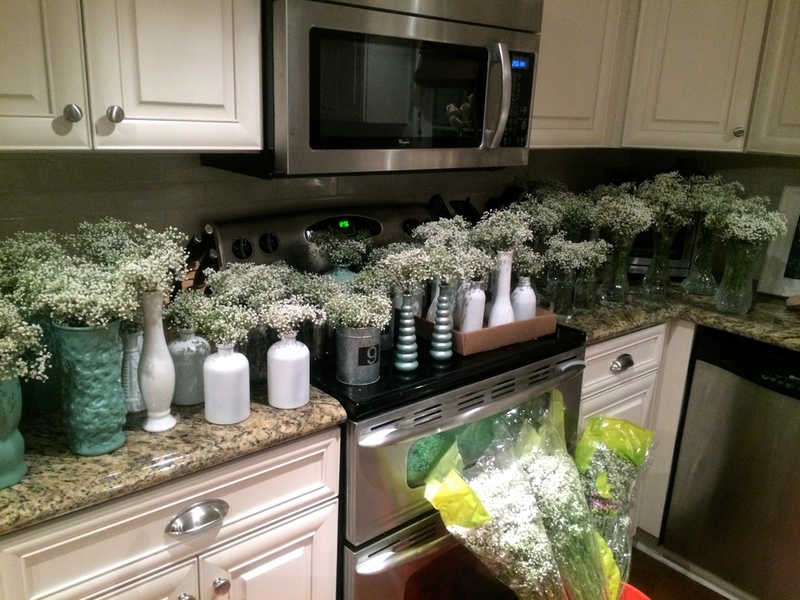 TOTAL COST PER CENTERPIECE: All in all, it cost us about $35 per centerpiece set. 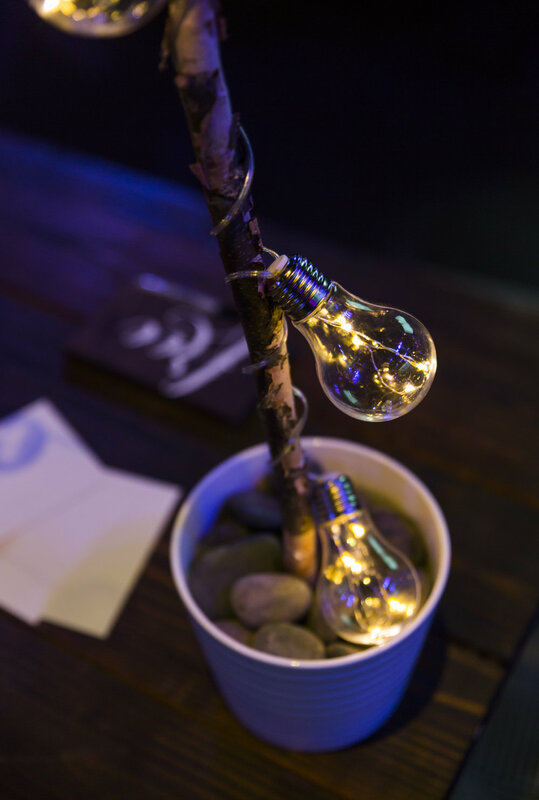 And the great thing is that we've already used these in multiple events - they are super versatile and add a touch of a soft glow to any room! First, I sweet talked my dear husband into cutting all of the birch sticks in half for me, so each centerpiece stands 2ft. high. Each birch log looks a little different, so as he cut them I numbered the bottom of the sticks to make sure each centerpiece matched in both pots. I also had him cut a notch in the top of each log so that the string lights can sit securely on top. Next, I used the spray foam to secure the logs inside the pot. PLEASE USE GLOVES! This stuff is legit and it will legit take the skin off your hands, so please use caution! It also expands fast, so start with small sprays to get the amount you need. 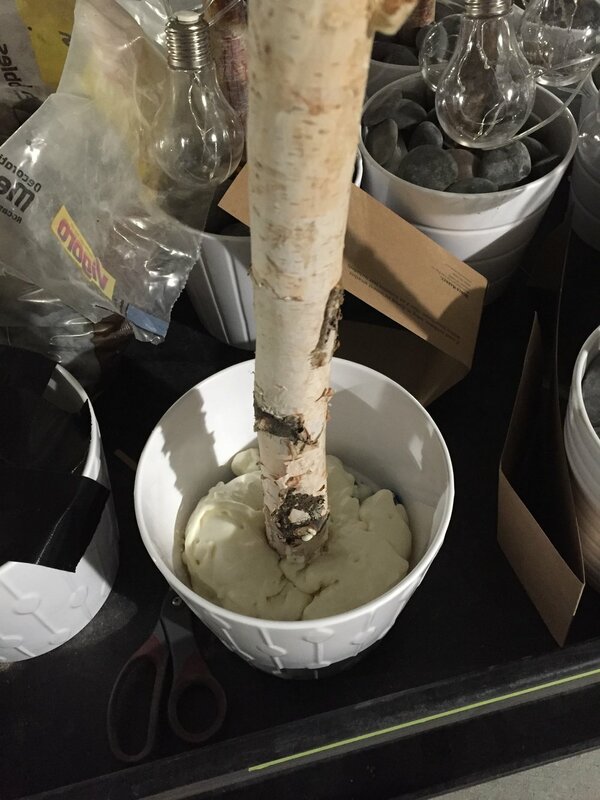 I filled the pot up a little less than halfway, then used the logs and/or tape to hold them in place while it dried. Allow several hours to fully set. Once they fully set, you're ready to add the lights and rocks. Wrap the lights around each log and secure in the notch on top of each pole. Finally, bury the battery pack under the pebbles and you're all set! The great thing about these centerpieces is that you can swap out the rocks for moss or something else cute to match the theme and style of your event - they are very versatile! We finished the look up with a strip of moss in the center of the picnic table and three cute votives. 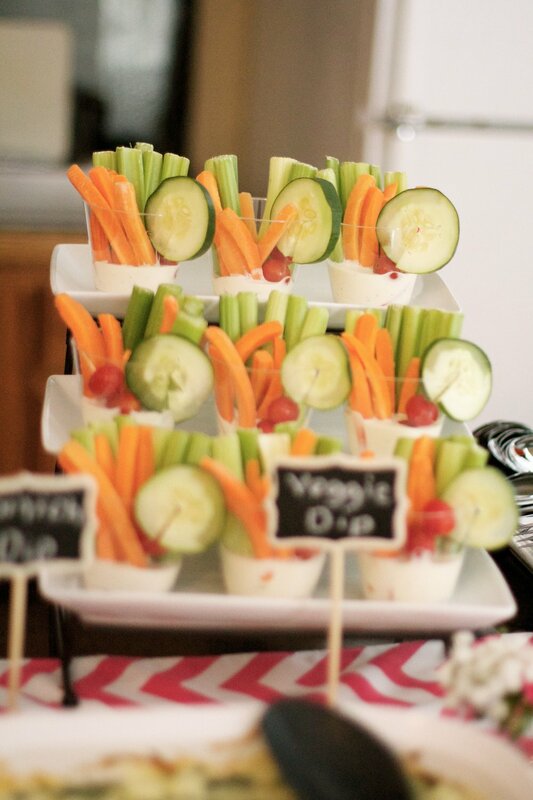 At our latest event, we also used them on some of the food tables. See more about that event HERE. I love the soft, outdoorsy look we were able to create with these centerpieces, even when our events were inside. Bonus: they would look awesome in a back yard or on a porch as well! 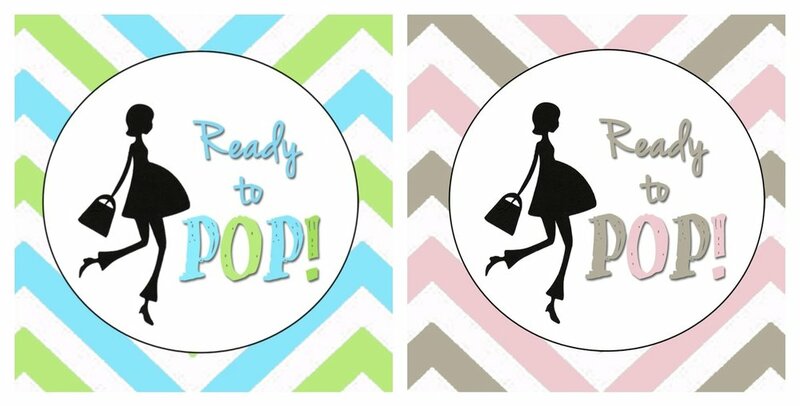 They're finally here...FREE printables for your next baby shower! 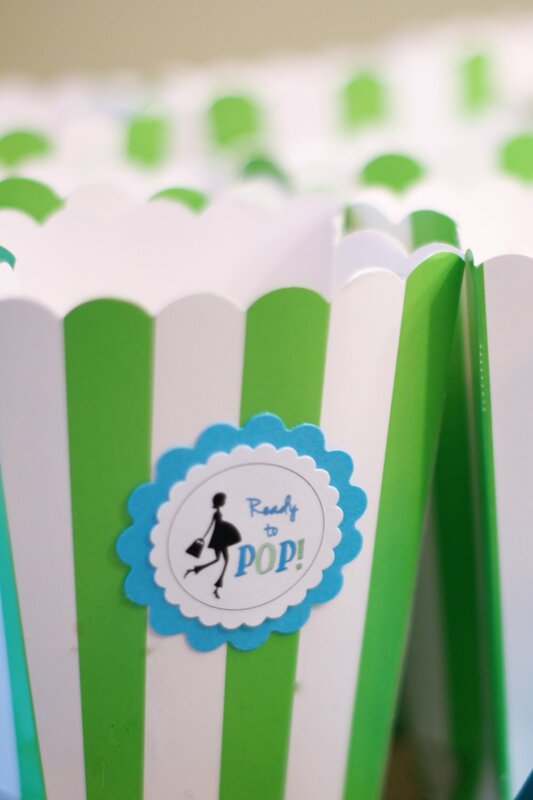 We had such a huge response from my previous POST about the "Ready to POP" baby shower I threw for my bestie, that I put together two different sets of FREE printables for you...so now you can have them for a boy or a girl shower! Simply choose your color palette below and click on the link to open and print! PLEASE NOTE: This printable is for your personal use ONLY. Files may not be sold, printed products may not be sold, and the designs may not be placed on items that are sold. If they are reproduced, redistributed or sold under any of these conditions, legal action will be taken. 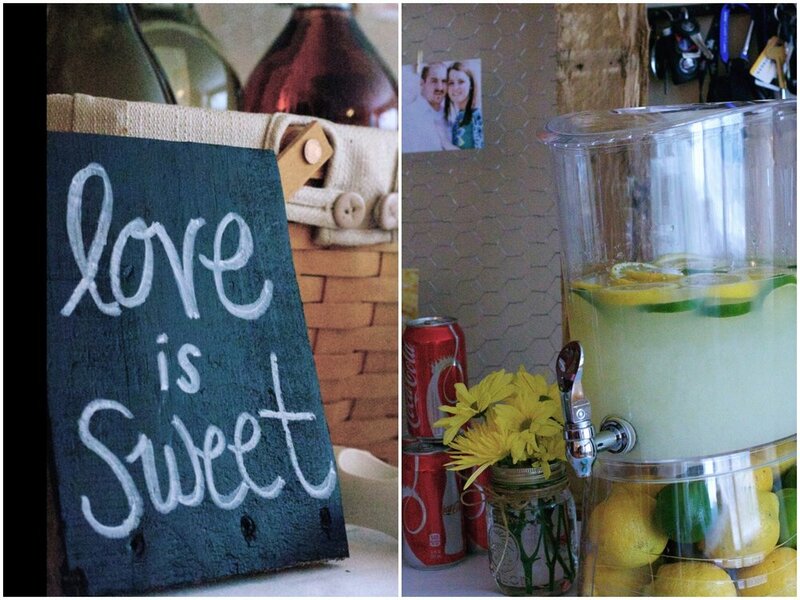 We're wrapping up wedding week with one of the sweetest weddings I've ever been part of. 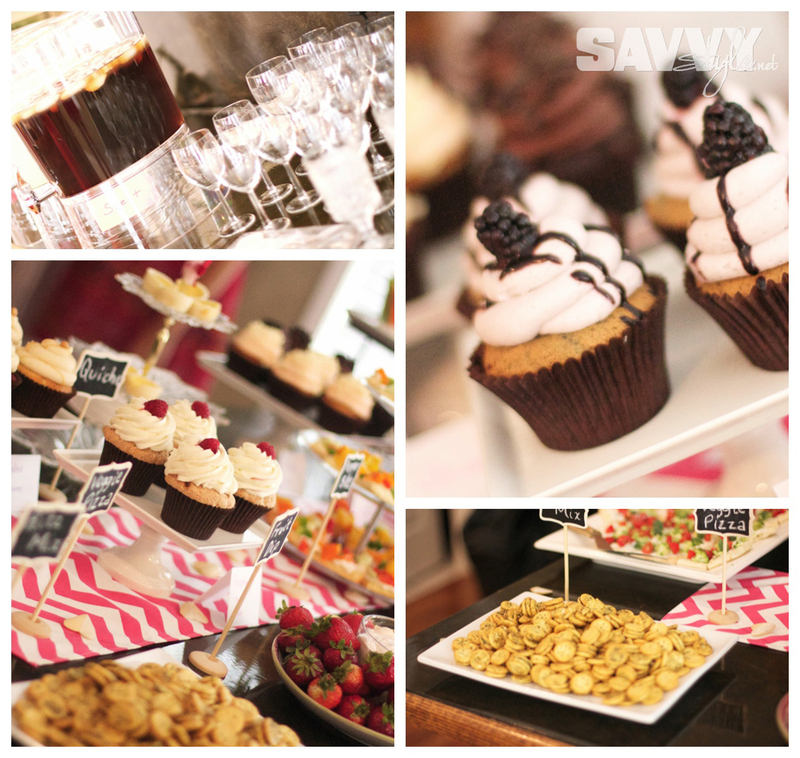 From the story of how these two came together to the dessert bar reception...everything about this day was just, well, sweet. And I couldn't have wished a sweeter day for two more deserving people! I could write an entire blog post on the incredible story of how God brought these two and their amazing families together. Jen is by far one of the strongest women I know with a faith like no other...so to see her find such a kind and caring protector like Tim was a true answer to many prayers. For their big day, Jen and Tim wanted a simple and intimate setting for their closest family and friends in an afternoon ceremony followed by a dessert reception. And if you know the bride, there are two things she loves: cowboy boots and the Clemson Tigers! 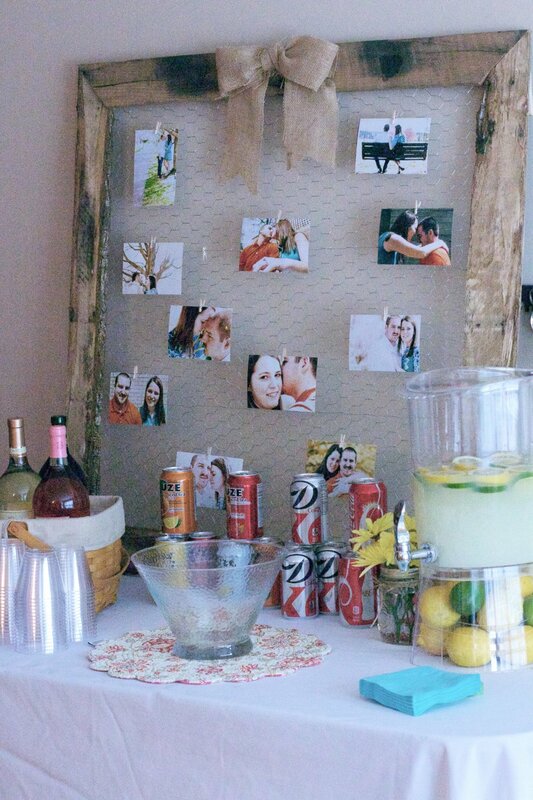 So of course, those had to be tied into the theme of this country casual fall wedding. All the guests who sported their favorite boots! Instead of a traditional guest book, family and friends signed these log slabs instead! The ceremony and reception were both held in the same room, but to keep things casual, the bride opted for round tables for both the ceremony and reception....or what I like to call a "family style" ceremony. With wood slabs, burlap, pinecones and pumpkins...these fall centerpieces were accented with some bright fall flowers (including Clemson orange and purple, of course) to match the bride's bouquet. Oh, and remember my awesome Craigslist fireplace mantle find from my sister-in-law's wedding? Well it made an appearance here as well, but with a few more "country style" accents! 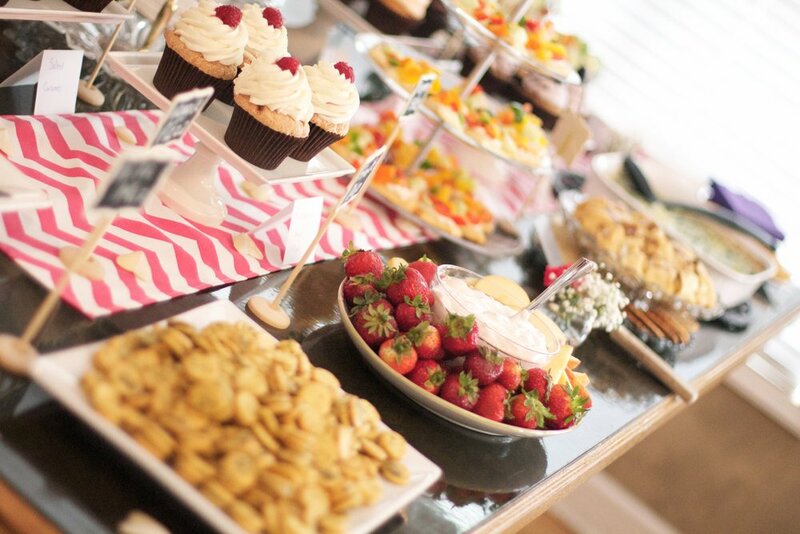 After the ceremony, guests were serenaded by live music from our buddy Chris Cauley (you might remember him from Team Adam on NBC's The Voice) while they enjoyed some amazing desserts! Then it was time to send off the happy couple! 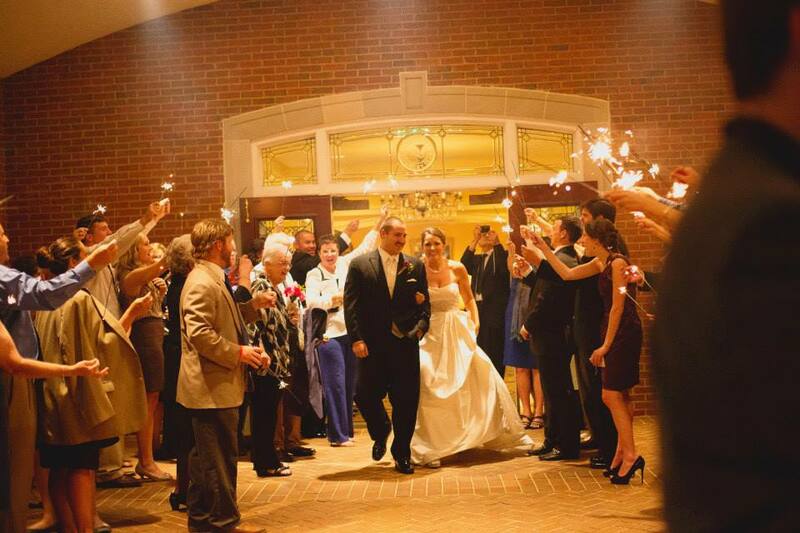 But you can't do sparklers in the middle of the day, so the bride hand made ribbon wands to wave them off..in true Clemson football style, of course. 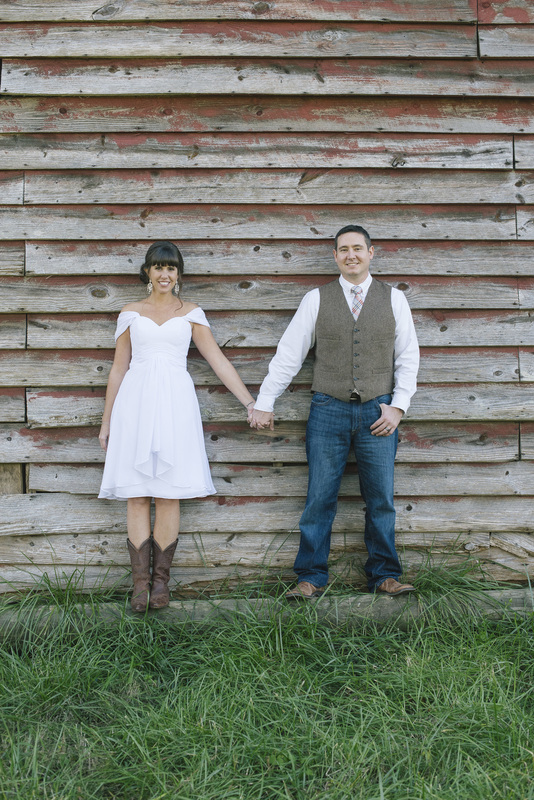 Cheers to a lifetime of love...and cowboy boots. All photos were provided by my dear friend Lindsay over at Lindsay Hooten Photography...if you're in the Atlanta area, you should check her out! We're having a blast talking all things weddings this week! When it comes to siblings in law...I hit the jackpot with this gal, she's just swell. We did this same pose at my wedding (see below right) and of course, had to carry on the tradition! Anywho...if you know Emily, you know she loves all things fairytale related. In fact, Clinton even proposed to her with an adorable Cinderella carriage snow globe (that we displayed on their cake table) So from the princess style ball gown to the sweetheart cupcakes and every detail in between, we wanted to make her day feel like her own special farytale. 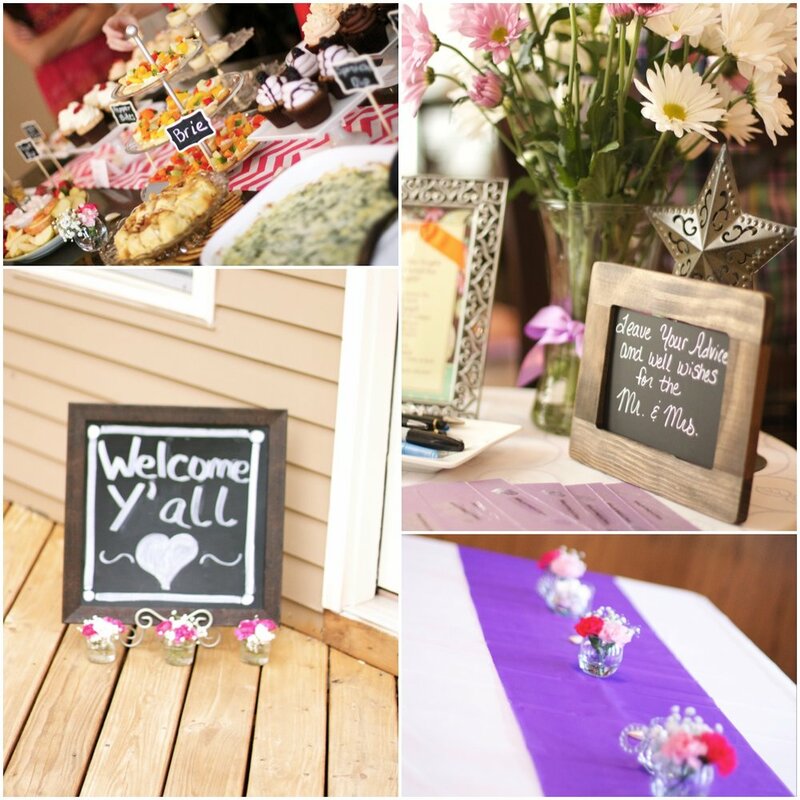 I LOVED the bright pink, purple and black color palette she chose...it was so vibrant and fun! And when we found dyed hydrangeas to match her vision, we hit the jackpot! Talk about getting some bang for your buck! We had flowers everywhere and they were gorgeous! The bouquets and arrangements were made up of pink & purple hydrangeas, green hypericum berries, hot pink roses and purple tulips. Now let's talk decor. 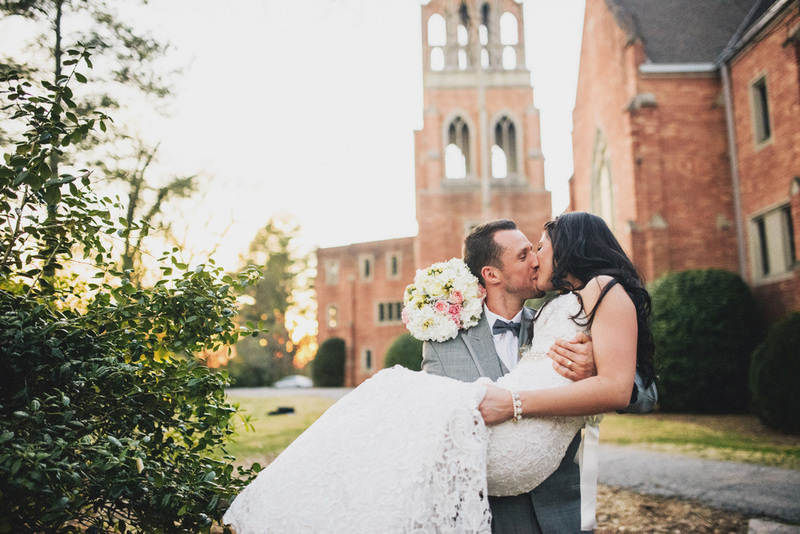 Emily wanted this fairytale day to have a country club setting with a slightly rustic feel (which I love, because in wedding world these days rustic is the new black). 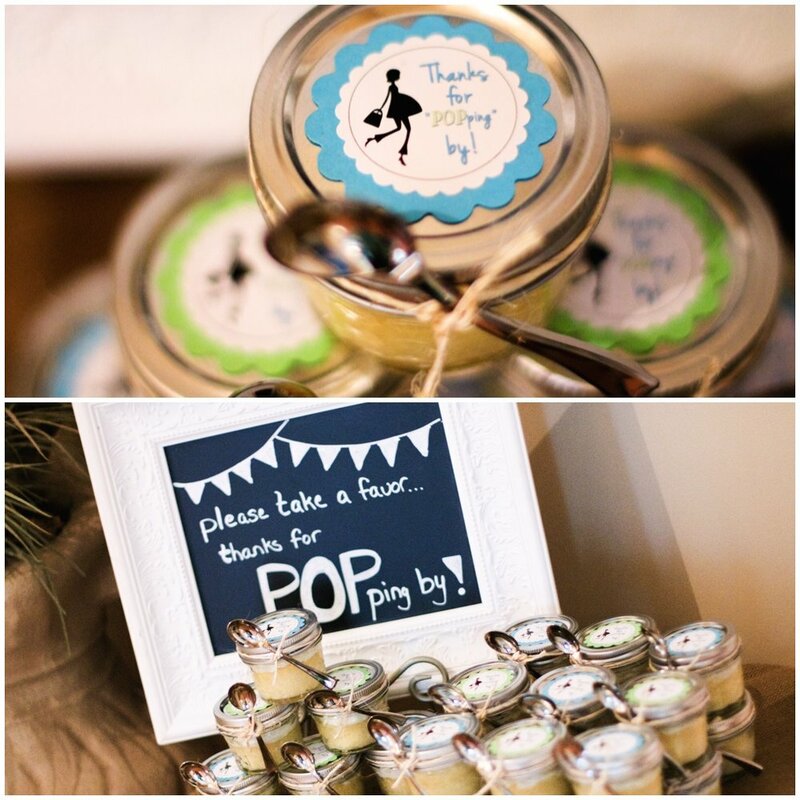 So we accented her decor with touches of burlap and mason jars...galvanized buckets and vintage lanterns, barn wood framed chalk boards and DIY distressed table number frames. It was lovely! Did you see that adorable little sketch in the picture above? That's actually their save the date. The bride's grandfather is an artist, and he sketched that picture for them. My husband then scanned it in and added the text...it was so cute and personalized just for them! I also designed all of the Bride & Groom's invitations, programs and wedding favors. 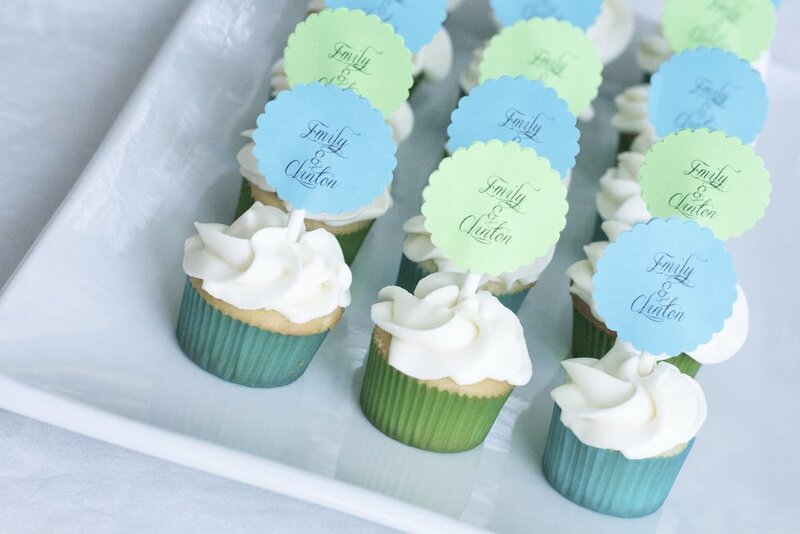 I created a custom "logo" for them that we placed on any of the printed signage for the day such as place cards, etc. The logo I created for them. The wedding favors were another adorable burlap touch, complete with the couple's logo and filled with purple and silver Hershey's Hugs & Kisses. The mantle was in great condition, so we just added two wood planks at the bottom to enable it to stand up and painted them white. I bought some sheer curtains at Ikea for $5 (similar HERE) and tacked them on the back to give the center some filler, and then we ran a strand of twinkle lights along the back of the opening to give it a soft backlight glow effect once the sun went down. It turned out beautifully! For the aisle, we couldn't actually do an aisle runner because the dance floor was already in place, so to jazz it up I created mason jar floral arrangements and accented them with burlap. 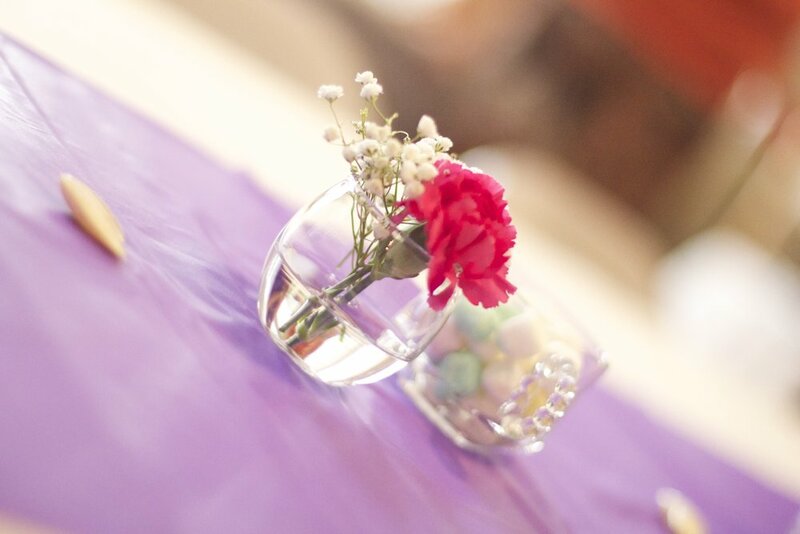 We then dressed the center aisle with pink, purple and white rose petals. After a cocktail hour on the veranda, the guests came back into the ballroom for dinner and dancing....oh, there was so much dancing! 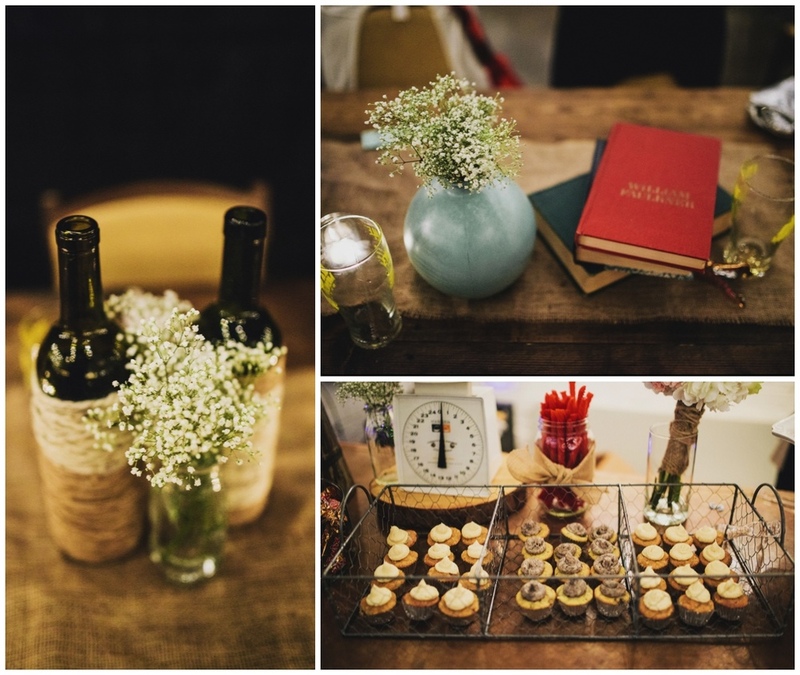 The centerpieces contained an eclectic mix of vintage lanterns (no two tables were the same! ), with mason jars wrapped in burlap, tied with ribbon that matched our bridesmaids dresses and filled with white hydrangeas. Those table number frames cost $1 each from Michael's. I painted them a purplish pink to match the decor and overlaid a layer of ivory to give it more of a rustic/distressed look. We used chalk-paper card stock (did you know they make that?! It's awesome!) and chalk pens, both also from Michael's. Flowers & Decor Design: Sweetwood Creative Co. 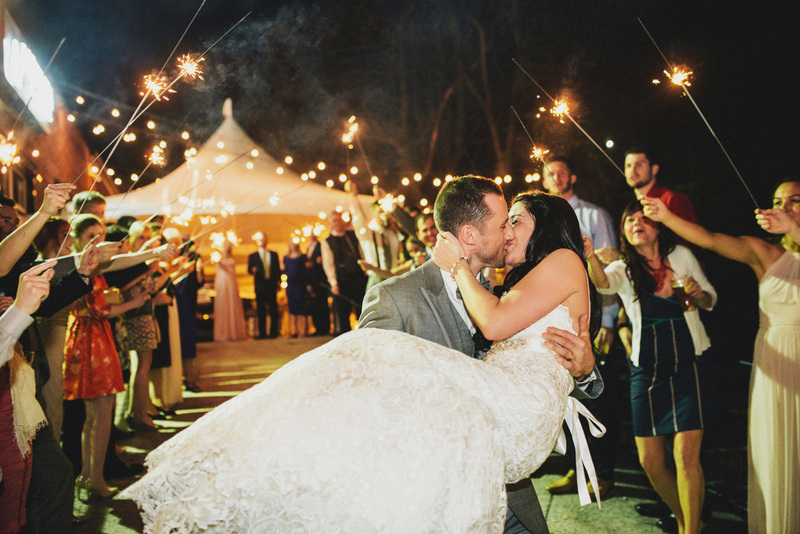 Here's to Emily & Clinton's Happily Ever After! 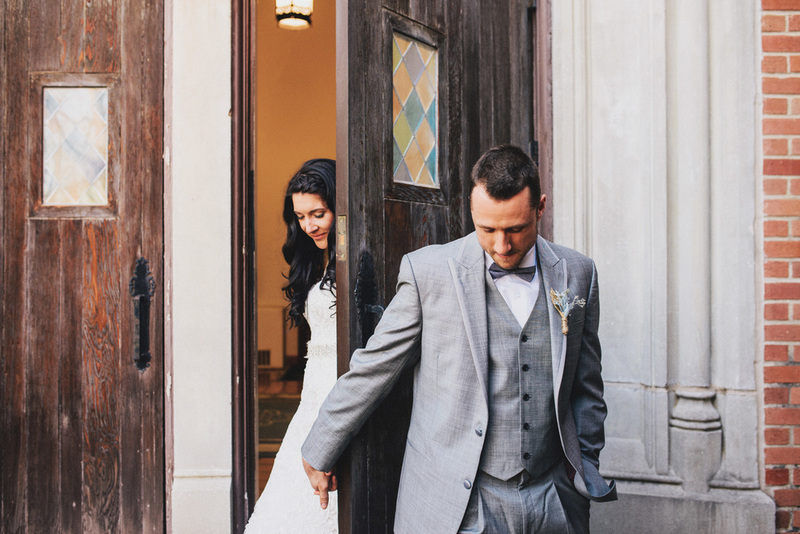 Their wedding day was just so sweet, but their love story and illustration of God's faithfulness has been even sweeter. Lindsey is a co-worker and friend of mine, and I've known Jonathan for years...so it's been really cool to watch two friends I've known independently come together and fall in love. And I was so honored to be able to play a small role in their special day! 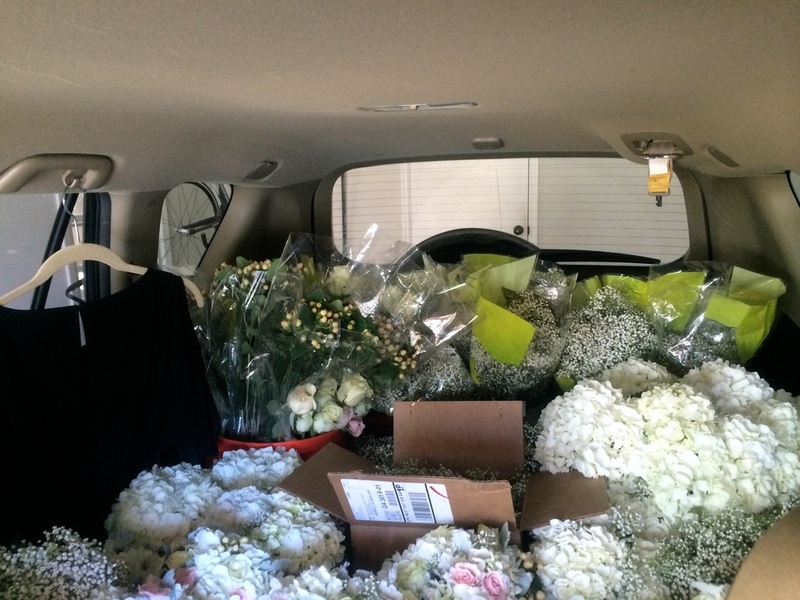 So I created 8 bouquets, 1 flower girl bouquet, 2 large ceremony arrangements, 8 medium sized reception arrangements and about 40 (yes 40..see pic below) small baby's breath arrangements for the reception tables...all for right around $450. I wrapped them all in burlap and tied with twine to continue the rustic feel. They matched perfectly with the bridesmaids blush dresses! Congrats to the happy new couple!